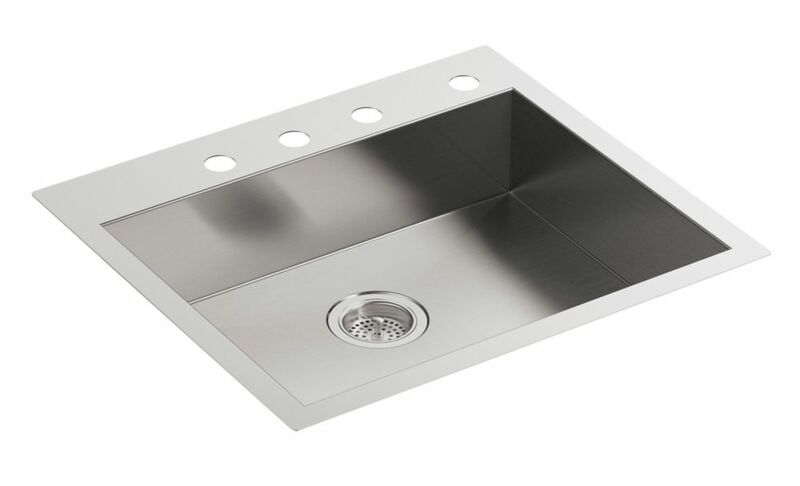 Designed for ergonomics and accessibility, this ADA-compliant Vault sink is handcrafted from durable stainless steel with bold, modern lines that bring contemporary style to your kitchen. Tightly angled corners maximize basin space, and the rear drain creates additional workspace and storage capacity underneath. An engineered sound-absorption system significantly reduces disposal and dishwashing noise for a quieter kitchen environment. This dual-mount sink gives you the option of top- or under-mount installation. When installed in a top-mount application, Vault's ultra-flat, 1.25-mm-thick rim makes it easy to wipe from the counter directly into the sink. Vault 25 inch X 22 inch X 6-5/16 inch Single Bowl Dual-Mount Kitchen Sink With 4 Faucet Holes Designed for ergonomics and accessibility, this ADA-compliant Vault sink is handcrafted from durable stainless steel with bold, modern lines that bring contemporary style to your kitchen. Tightly angled corners maximize basin space, and the rear drain creates additional workspace and storage capacity underneath. An engineered sound-absorption system significantly reduces disposal and dishwashing noise for a quieter kitchen environment. This dual-mount sink gives you the option of top- or under-mount installation. When installed in a top-mount application, Vault's ultra-flat, 1.25-mm-thick rim makes it easy to wipe from the counter directly into the sink.